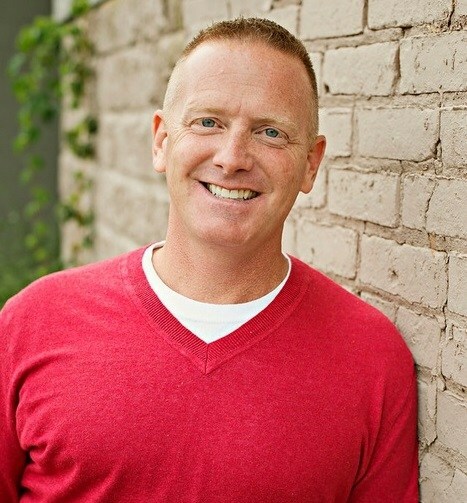 Last Friday I chatted with the always-colorful talent acquisition analyst Tim Sackett. 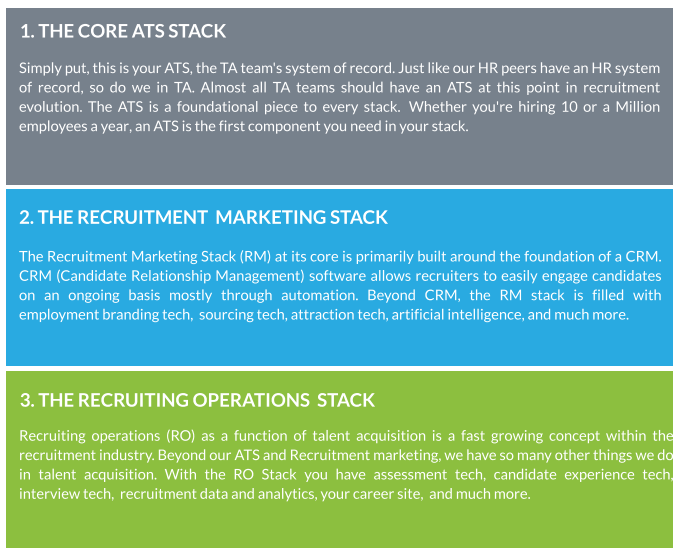 He had sent me a PDF of his “Talent Stack” (software for ATS’s, recruitment marketing and recruitment operations). Tim’s got a new book coming out and he’s thinking hard about talent acquisition software. I like Tim because he calls ’em like he sees ’em…with strong opinions and predictions. You can also download a free copy of the PDF with 100+ recruiting software solutions here. Q: How’d you start the Talent Acquisition Talent Stack? So, I go out and speak quite a bit. And when I when I go to speak, the number one question I get asked is what ATS I should buy? So so you end up finding out all these really cool stuff. And so the idea came where I wrote the The Talent Fix — the book that comes out in May. When I talk to corporate talent acquisition leaders out you know the question I get from them is like Tim, tell us how to fix our recruiting — recruiting is broken. How do we fix it? Choosing the right recruiters on your team, all the way through your tech stack through employment branding to recruitment marketing. I kind of wrote all of that down…My book was not ready…so how do I how do I get people…collect data and emails and get people who are interested? So I said, Well, I constantly get hit up for tech questions…and so then I started thinking, Okay, well, if I built a tech stack in corporate TA, what kinds of things would I need? And then I tried to put the technologies in buckets, because again, it got so big, so fast that I was like, how do I break this down into manageable bites for somebody who’s running a mid-sized kind of shop (you know, a 1,000 or 2,000 person company…someone who’s going to make you know 200 to 500 hires in a year — what’s legitimate for me to look at kind of stuff. And so that’s what I came up with the Talent Stack. Take interview screening technology… what should I look at? Boom!..here’s five — I don’t know which one’s better for you. I don’t even know if they’re the best ones in the market, but it’s five that I’ve looked at. So, go ahead and look at them yourself. That’s kind of where [the Talent Stack] came from. Q: How did you pick the 3 parts of the TA Stack? Many ATS’s will do many parts of this probably but no ATS does all of it. Some ATS will say they do all of it, but some of its just so bare bones that it’s not easy — it’s not even really a product. It’s just kind of a feature for them. Q: What was the biggest surprise in your Talent Stack research? I was thinking like maybe 30 or 40 or so…but it ended up being over 100…which shows just how complex the TA tech stack is right now. Because you and I both know that 100 [tech stack tools] is just a fraction of what’s really on the market. Q: What’s the closest thing to “one-stop shopping” in your buckets? Yeah, I mean, it’s definitely going to be an ATS. 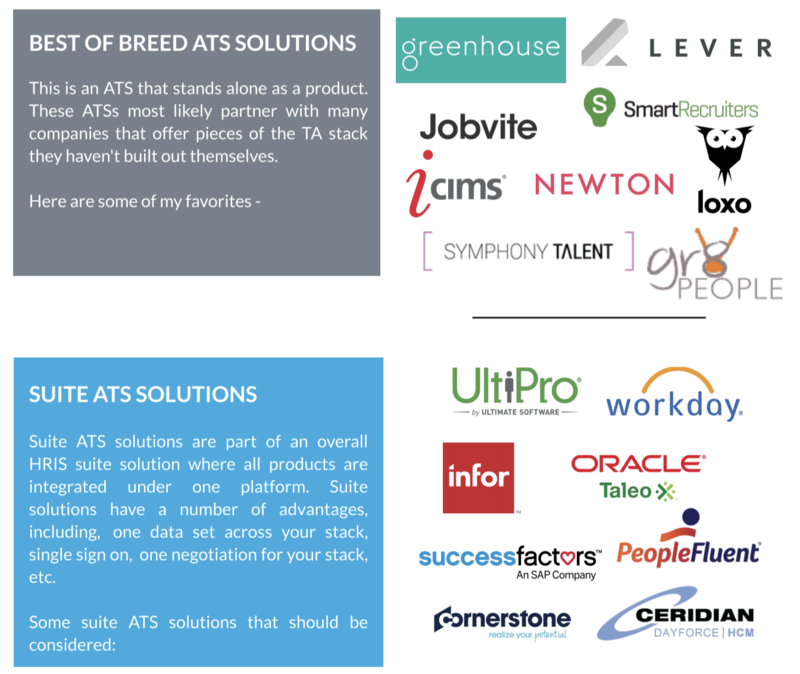 Yes, it’s ATS’s that I think either have already integrated a recruitment marketing type solution or they have the marketplace with integrations that are already built that you can kind of just click and now you have that functionality. So you’re looking at people you know like a Greenhouse or a Lever or Smart Recruiters…that has a really good marketplace. There’s also Ultimate Software…if you really want to go full solution right with HCM. I you know ICIMS might be the one that has the overall best marketplace like that. And I would say when I take a look at enterprise level ATS systems because that’s a completely different animal…because then now you’re going like the Workdays the Oracles…and SAP. Their core strength is HCM.…when you talk to [HCM Suites] individually behind closed doors, you know, they will tell you: “Yes we know it — because they know their core is actually HCM. But you know their HCM clients come to them and say well we want one umbrella solution that does everything…we want talent. But when you take a look at actual enterprise level now, you’re looking at, you know, someone like iCIMS who probably can do enterprise ATS better than anybody even though their UI and UX …well, I hope it gets a little bit more appealing to the eye when they bring [their new version] out — they probably built that out a little better. But again, Greenhouse, Smart Recruiters, Jobvite, Lever. They’re all right there. Q: Didn’t gr8people start off focused on staffing/RPO? Yeah…Cielo actually probably paid to have them built and then they decoupled themselves from Cielo altogether and went out on their own. And so since then so they were built for an RPO type environment but the stuff that they built is really attractive to corporate talent acquisition and that’s really where they’re looking to grow. One thing I loved about Symphony Talent from an ATS perspective…is how built-in programmatic is. Symphony is ahead of their time by probably two or three years. I think eventually every single one of these ATS’s will have programmatic built in. What we love in TA is to go out and say, Oh, well, I’m just going to buy a job slot from LinkedIn and it cost me $1,500 a month and I’m fine with that. And you’re like, you know, you’re probably overspending for that by like two or three times what you should be. Q: If you were building a team hiring 200+ people per year what would your talent stack look like? I’d start with a top 10 ATS. if I’m using that ATS to its fullest, I’m not going to miss anything from…any of the other ones and there’s not gonna be one that’s better than the other. I mean everybody needs to get a base. So I would I would first start there. But then if I didn’t have one of those really kind of modern ATS’s, I would go through the RFP process and pick one of these and I would probably take a look at whatever functions are based on hiring for me…there’s certain things that they just have to have. I had a demo this week with an ATS provider and…I just finally stopped him and I said, so tell me your biggest client and they said oh it’s Starbucks. And I said okay so Starbucks is helping you with this right? And they say: oh my gosh yes …they’re by far our biggest brand. They [Starbucks] don’t know what they don’t know. …and so you’re building something that they [Starbucks] believe they want instead of something that you should be saying: here’s what you need. And that’s, again, that’s what I love about Greenhouse. What I see is in the biggest kind of enterprise organizations is that they’re really behind in how they hire…because they’re so big and their brand is so powerful. They don’t really have to recruit they just post and pray and so they’re looking for a very compliant system that just forces people to jump through a bunch of hoops. Q: What would you choose after an ATS? And then I’m definitely going to have a…CRM… that can nurture my database…nurture candidates and have some retargeting capabilities. And then I’m going to build in a sourcing AI engine that is working 24/7, 365! — an AI engine that also has screening capability..I mean a light screening capability… that’s constantly nurturing not only my database, but the new candidates coming in as well… and then filter them up to a point where my recruiters are talking to interested, vetted candidates and spending my time there. And so I would do that. And then if I had sourcers they’re going to be really deep-dive sourcers…for specialty rolls and they’re actually doing the cold-calling and really digging in. Q: By the way, do you want to be a head of TA again? Hmm…it would have to be a really special role where I probably had direct access…kind of equal you know to a COO, CPO kind of thing. …I don’t know like…the big corporate… you know going to work and run TA for like Marriott or someone like that… does not entice me — that seems like the biggest nightmare in the world. I think the only other thing…is that it’s still that [HCM] Suite solution versus best of breed that, you know, again, it’s not hard to build a best of breed tech stack. A [TA] leader going well, if I have all these disparate systems they are not going to talk to each other. …and again there’s there are solutions out there for that — you just plug into your stack and they’ll actually probably give you better data than you’ll get out of some of the [HCM] Suites. There’s a big concern on the horizon. If I’m a leader in that a big HCM is going to force me to, you know — because my head of HR and my head of IT and always people basically chose Oracle or chose SAP or chose Workday — then now I’m going to be shoved in with a lesser solution. “And then I’m going to be held accountable for producing great results with handcuffs on”. The differentiator from an [HCM] suite then becomes: hey, are you helping us actually retain and obtain talent? …and right now that’s hasn’t been something that [HCM suites] have really focused on. Q: What about on-boarding in the Talent Stack? The on-boarding [category] was one that I think was interesting because people are going to argue on-boarding is not a TA function. It’s an HR function. And I think I still think it’s one of those functions that stuck in the middle. …and then we handle them to HR who treats them like a piece of crap. I kept on-boarding in the TA Stack because until we can figure out how to get HR to treat new employees and incoming employees as well as we treat them as candidates…then we [in TA] have to keep it. Q: Where are chatbots in your Talent Acquisition Stack? Yeah. Canvas, Text Recruit is in the Communications [sub-category]… I think I put it mostly in the Sourcing… yes I did…[it’s in] Recruitment Automation. So you have Arya, Mya, Ideal, Textio, Ari and RAI and Paradox and all those are in Recruitment Automation.